Blessed by the evening snow, kissed by the morning sun, the whole of Owyhee basks in the warmth. 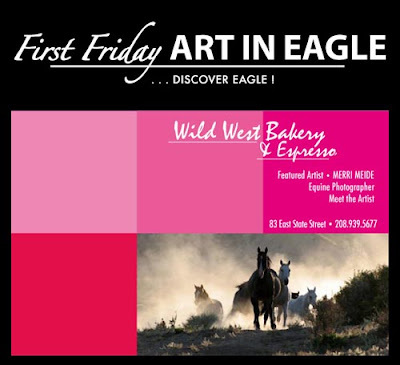 We'll look at more original Owyhee Wild West trails and stories, but this time, think the Wild West Bakery and Espresso in downtown Eagle. We are happy to be participating in the First Friday Art in Eagle - a gallery walk in downtown Eagle on Friday February 5 from 4:30 - 8:30 PM, featuring my photography and barbed wire art (original rascally Owyhee barbed wire! ), Naomi and Michelle (her manager)'s home baked goods and espresso, and wine tasting by local Woodriver Cellars. 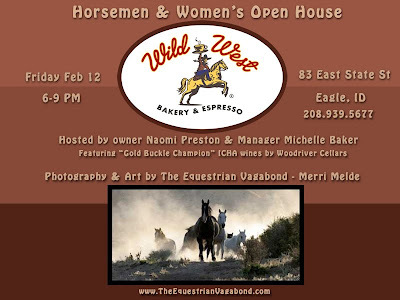 The party doesn't end there: the next Friday, February 12, we're having a Horsemen and Women's Open House, from 6-9 PM. Wine tasting again by Woodriver Cellars, featuring "Gold Buckle Champion" ICHA wines. If you have horses, ride horses, love horses, or want horses, stop by to see us and tell us a tall horse tale of your own, if you can get Naomi and me to shut up. If you don't love horses, stop by anyway, and we will try to persuade you that you should. Note: The Raven will be present at both special openings - I don't think he's signing autographs, but he will be available for photos! Mother Nature made an attempt to pacify my clamoring for snow. She left an inch and a half of wet snow on the crick last night. It wasn't particularly impressive, since it's already started melting, but, it was a noble, admirable effort! Lest you think it's all play and Equi-Pilates here, the Owyhee herd is serious about their snooze time, too. A siesta in the morning or afternoon Owyhee sunshine is the best tonic for a hard-working herd. Hay is the main repast here, of course, but the horses like - and need - a variety to their meals besides hay, hay, and more hay. getting their buffet of greens (or browns, this time of year). They snack on the dry cheat grass, and they nibble at the tumbleweeds - Russian thistle. I can't imagine how they chew on this nasty prickly stuff. and they carefully chew it. The seeds and leaves are supposed to taste salty, but I can't taste anything but wood in these dead-looking winter branches. Rice grass is a treat, and already the green grass and weeds are starting to sprout in this near spring-like weather. They have to work to get tiny bites of them, but work at it they do. Salt blocks seem to be used more now than in the summer. An occasional bite of alfalfa is a nice delicious treat; and if you have a carrot within fifty miles - forgetaboutem! That's what I'm talking about: snow, for real, here! However, it's only minimal ground cover, and it's wet: instead of your footsteps rubber-squeaking in the snow, they squish and slop. The horses look like wet chickens. Gray horses get nice and dirty in this mess. And it feeds my obsession just enough to keep me going till the next snowfall.